The Philippines is full of adventure, amazing landscapes, and spectacular scuba sites, including Anilao diving. 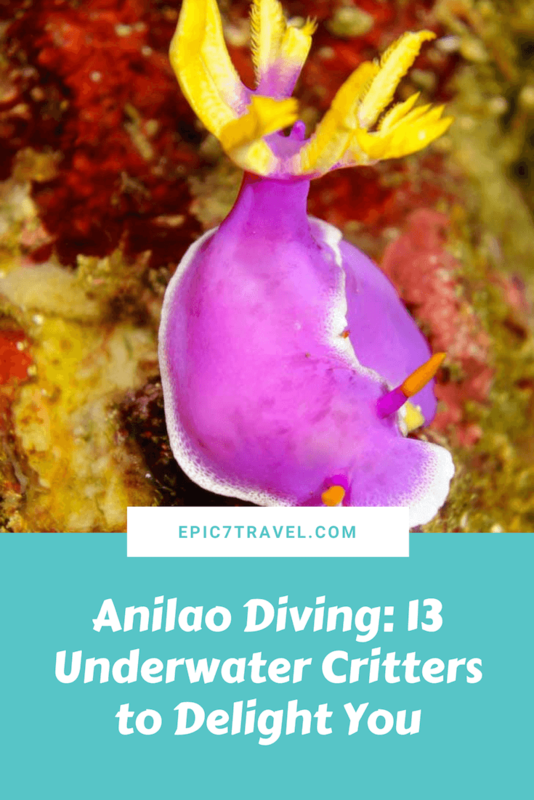 After exploring the shipwrecks in Coron and the crazy macro critters in Dumaguete, we returned to the Philippines to indulge in impressive Anilao diving. 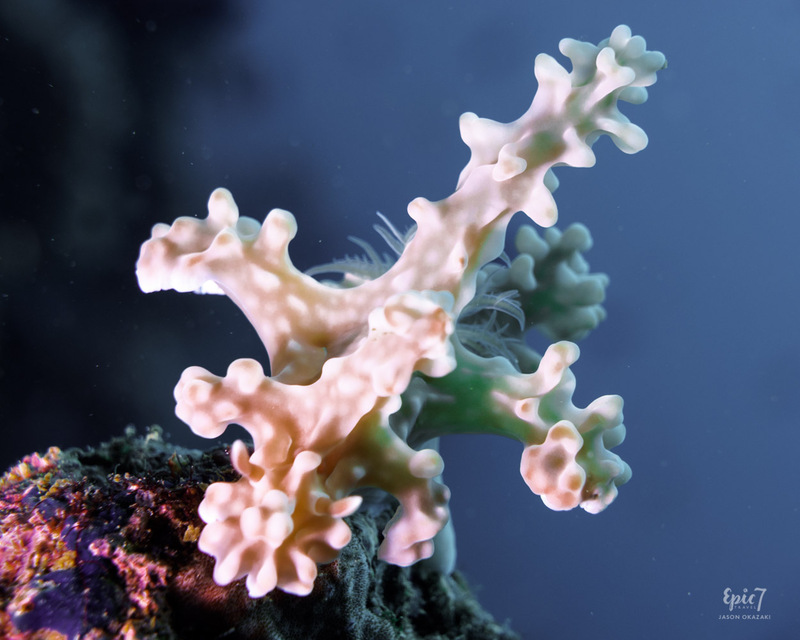 Be prepared to discover lots of unique underwater critters in Anilao. Located only three hours south from Manila, you can land from your international flight, transfer to Anilao and potentially indulge in nighttime Anilao diving your first day. Crystal Blue Resort’s dive guides, camera room and lovely views provided the perfect combo for our weeklong Anilao diving experience. 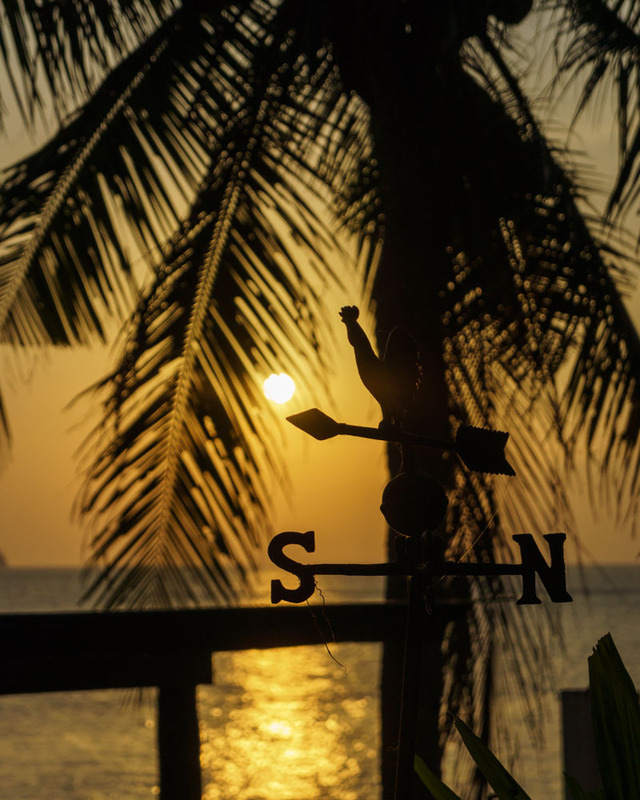 Given that we typically scuba dive in Asia from May to December with 82F (28C) water, we were unprepared for the colder 75F (24C) Anilao diving temperatures in March. While having lunch the first day, I commented to Jason that it seemed odd divers were wearing hoods along with thicker wetsuits. As we rolled in for our first dive, the cold water shocked our systems. We quickly discovered our well-worn 3mm wetsuits (with 200+ accumulated dives) weren’t warm enough. Given the shallow, non-current diving, we could have easily explored for 90 minutes. However, we couldn’t last longer than 40 minutes in the colder temperatures. TIP: For 75F (24C) water temperatures, a 5mm full wetsuit + hood is needed to keep you toasty. While that sounds warm, your body loses heat 25x faster in water than in air. To supplement the warmth, we also wear Fourth Element or Lavacore vests under our wetsuits. As a result of the cooler temperatures, many interesting critters venture into the shallower waters from the deep. Anilao is known as a nudibranch (seaslug) haven. The variety will astound you. This is the ONLY place we’ve seen the Alleni nudibranch – a beautiful species with elaborate appendages that make it resemble coral. So what kind of cool critters can you expect to discover? 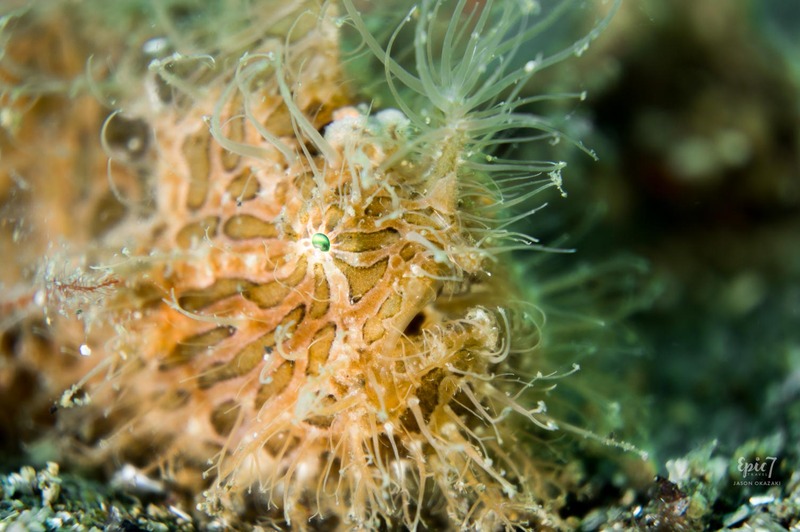 Read on to learn about 12 other fascinating underwater creatures we observed during our Anilao diving. Spotting a blue ring octopus (Hapalochlaena maculosa) during Anilao diving is extremely exciting. Although tiny and beautiful, they are considered one of the deadliest sea creatures. When agitated, their blue rings pulse a brighter blue color. Since they aren’t aggressive and don’t pursue you, we are cheering rather than scared when we see them. Although they are small enough to fit in the palm of your hand, their deadly tetrodotoxin could kill 26 adults within minutes. Therefore, it’s important to NEVER touch one. Since their bites are painless, many don’t realize they’ve been bitten until they have respiratory distress and paralysis. 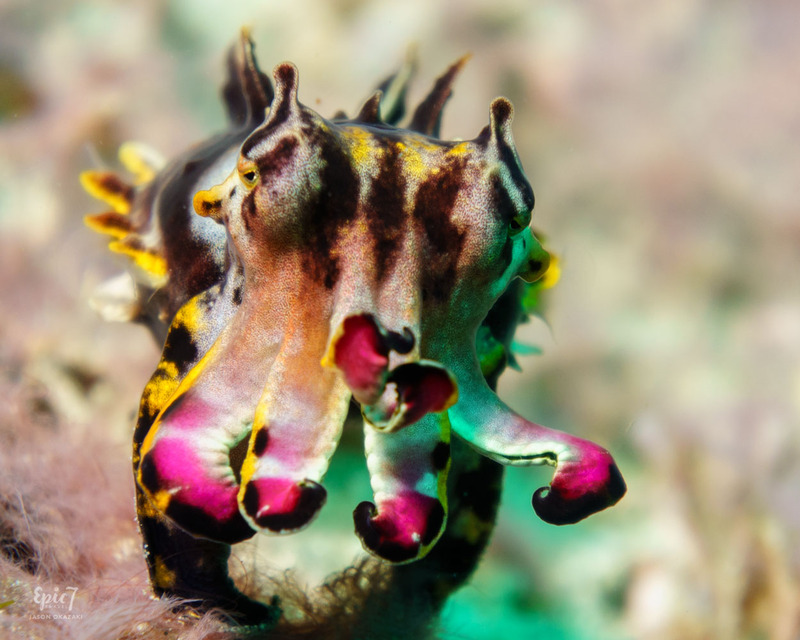 Flamboyant cuttlefish rank as one of the most gorgeous underwater critters. As a result of their gradated colors and tentacles, they resemble an orchid. After waiting years to see one of these critters, we were elated to observe them during our Anilao diving as well as in Lembeh Strait, Indonesia. The kaleidoscopic pulsating colors can mesmerize me for most of a dive. And, the fact that they lumber along the sea floor bottom like a tiny hippopotamus (rather than swimming) makes them all the more endearing. Measuring only .5-3 inches (1-8 cm), these miniature cuties can often be found sitting/hovering near the bottom during shallow night dives. Like many cephalopods, they only live one year. Despite their tiny size, females lay 1 – 400 eggs at a time. Since they are nocturnal, they bury themselves in the sand during the day. As a result of their bioluminescent bacteria, their silhouettes are hidden at night when they are hunting. Interestingly, the US Air Force has studied these reflective qualities to see if it can be used to camouflage stealth planes. 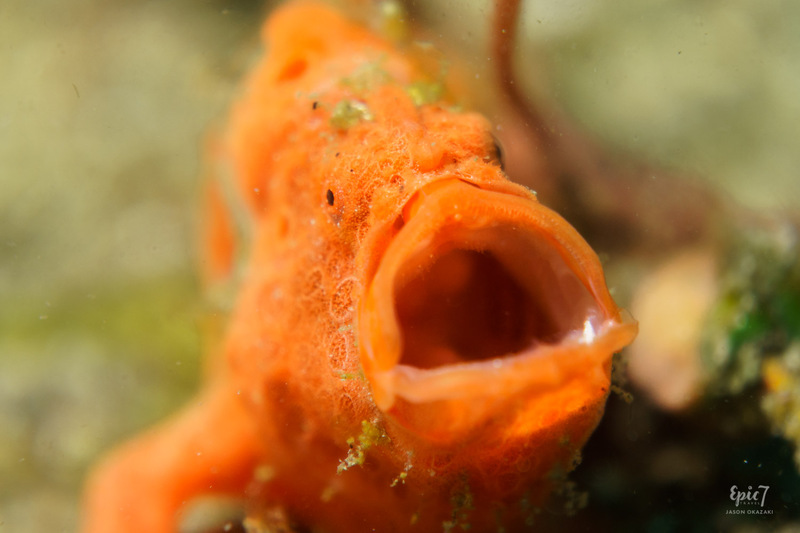 As scuba divers, we find that frogfish never get old. As a result of their downturned mouths, they appear to be curmudgeonly prehistoric creatures. A number of varieties exist including painted, warty, hairy and psychedelic. 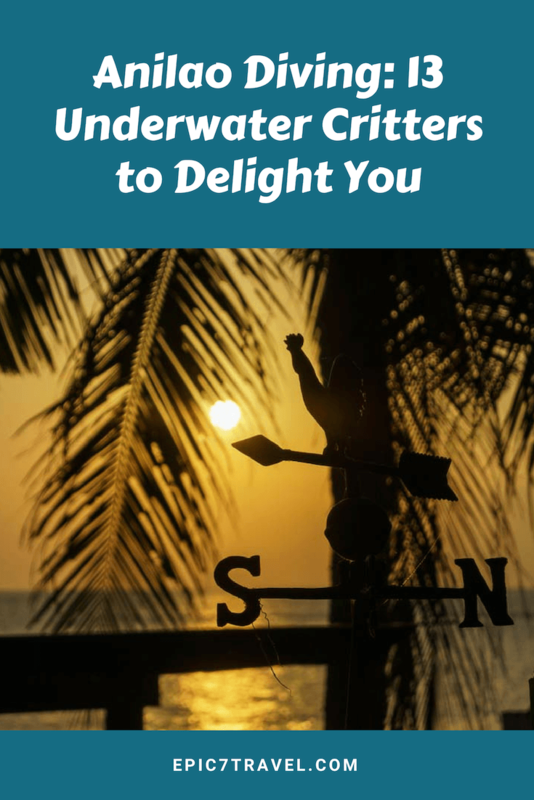 The two latter versions rank the highest on most scuba divers’ wish lists. Watching these ambush predators walk along the bottom, yawn or catch prey at lightning speed is always interesting. Using a “lure,” known as an esca, on the top of their heads, they attract their meals. Since they can expand their jaws to 12x its size, it enables them to consume critters twice as big as they are. After seeing the Glossodoris Cincta nudibranch in Papua New Guinea for the first time, we are always on the lookout for this striking species. 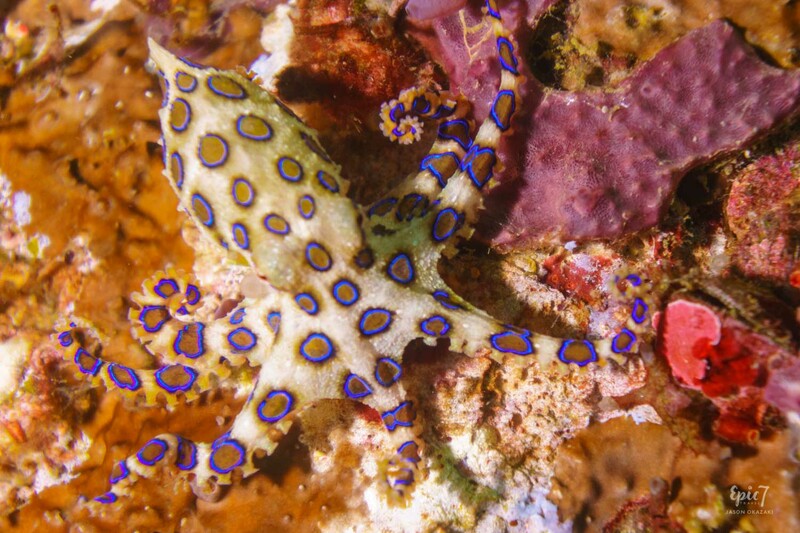 The ruffled blue and yellow bands along their edges, combined with mottled red and white dotted skin, make them captivating photography subjects. As they glide along, the frilly edge movement is entrancing. Doesn’t this Janolus sp 7 sea slug appear handpainted? 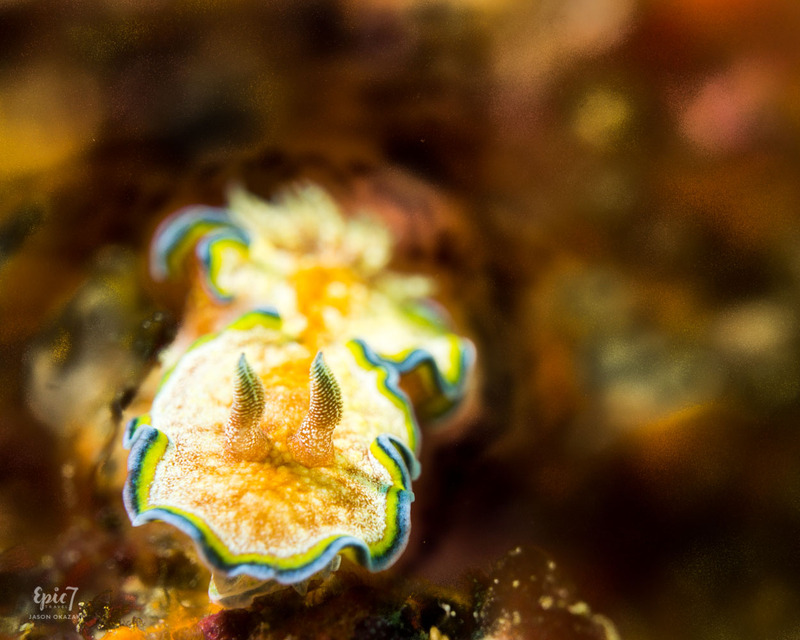 Seeing this Janolus sp 7 nudibranch during our Anilao diving trip ranks as a trip highlight. It seemed to be an artist’s creation as a result of the delicate yellow rings that surrounded the gradated purple tips. Anilao diving is for the nudibranch variety and did not disappoint. Finding long-horned cowfish when diving always makes us happy. Since they are clumsy and always seem to bump into things, I consider them my underwater spirit animal. Their green eyes are stunning and the purple markings appear hand printed on their vibrant yellow skin. Given their extremely shy nature, they often dart under table coral to hide. Thinking they are being stealthy, they peek out, hoping you have left. Propelling themselves with tiny fins on their sides, it seems as if they are always spinning in circles. So, it’s rare that you can capture a head on photograph. 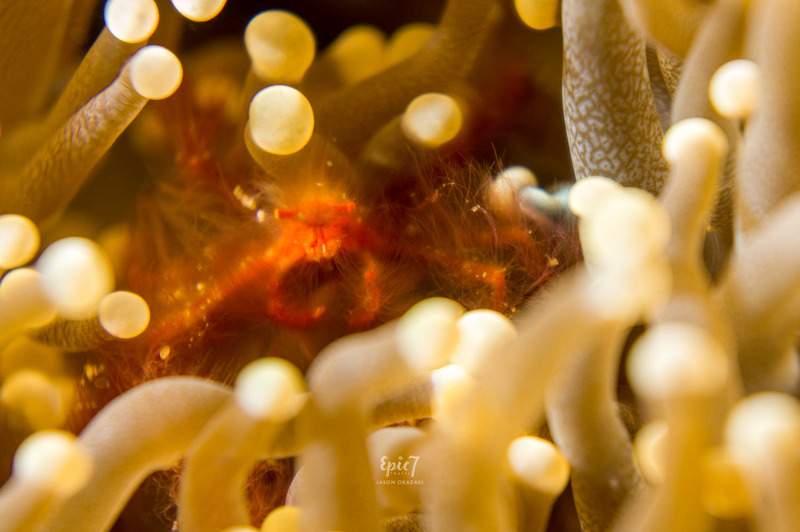 Since orangutan crabs (Achaeus Japonicus) are only .8 inches (2cm), patience is key to spot these tiny Anilao diving critters wandering amongst anemone tentacles or bubble coral. Waiting for these adorable crabs to move into a spot where you can see or photograph their fuzzy orange “hair” is worth the time investment. 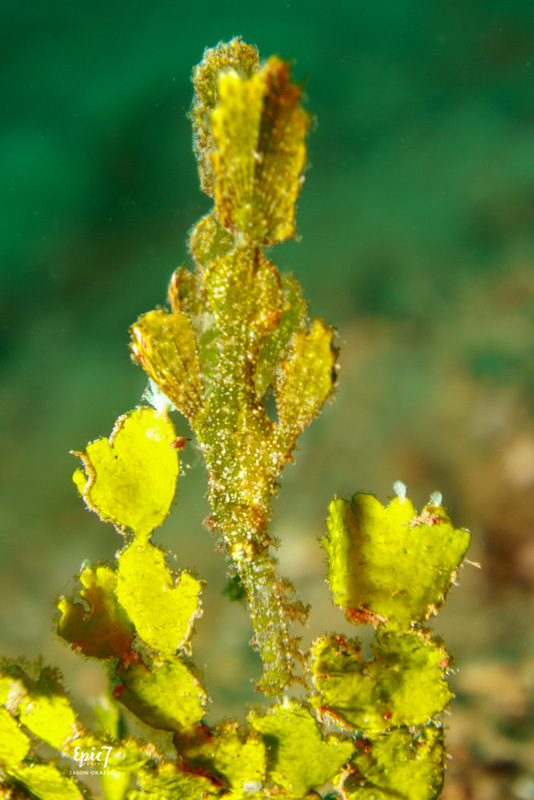 The Halimeda Ghost pipefish ( Solenostomus halimeda) is a brilliant camouflager. Since they are often floating head down amongst algae, we only spotted these tiny green pipefish as a result of our Anilao diving guide’s eagle eyes. Measuring only 2.5 inches (6.5cm), your eyes will often pass right by them. 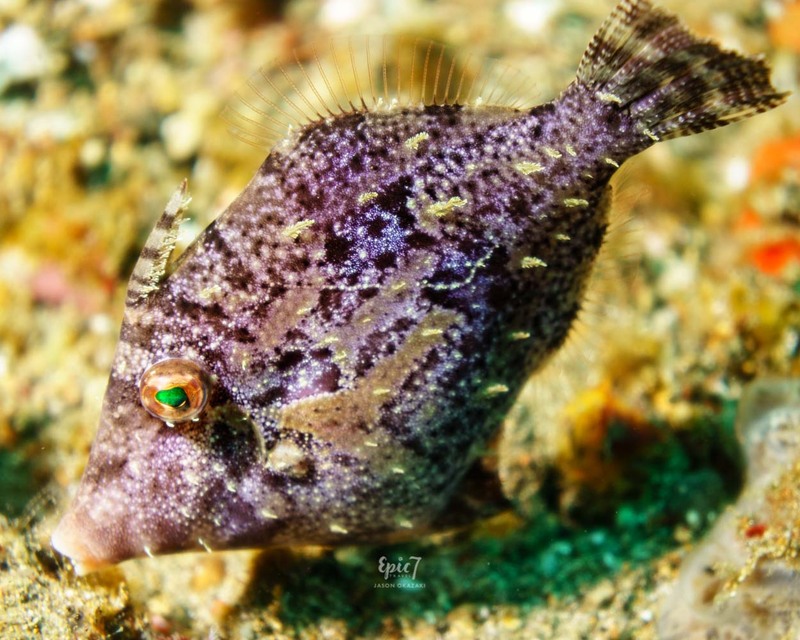 Filefish (Monacanthidae) tend to be very shy. Just as you decide to snap a picture, they seem to turn away. 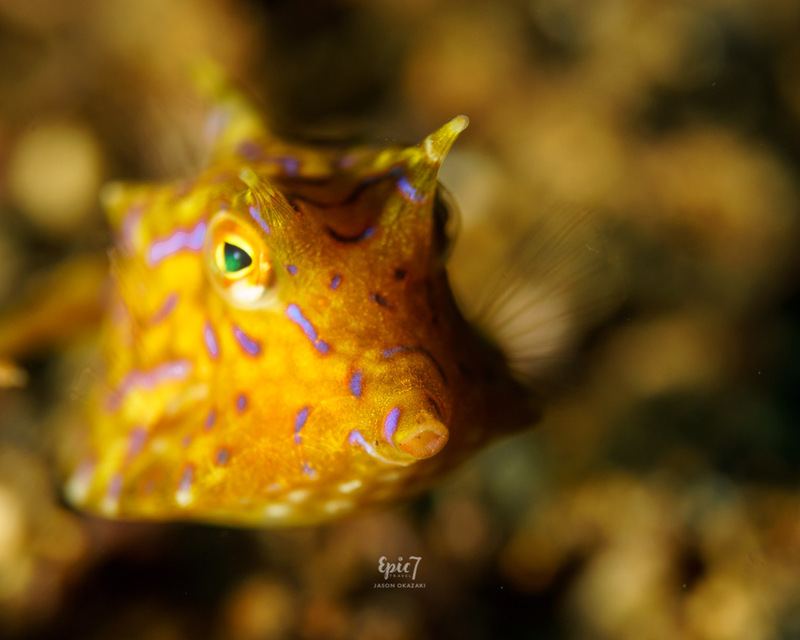 While in Anilao, we were ecstatic to glimpse our first ever purple filefish. We loved its mottled design and bright green eye. After it positioned perfectly over the sandy bottom to nibble, we were able to capture an image of this photogenic little guy. Interestingly, they often extend a retractable spine on their heads, which looks like a punk rock pompadour. Photographing elusive long-nosed hawkfish is extremely challenging since they blend in with their gorgonian sea fan or black coral hosts. This, combined with their short attention span, is a recipe for frustration. 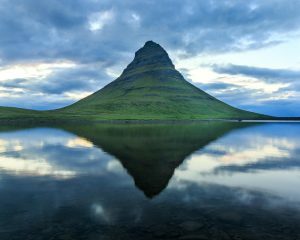 Just as your eyes focus and you begin positioning your camera, they move again. As a result, most pictures you take will be a blurry backside. 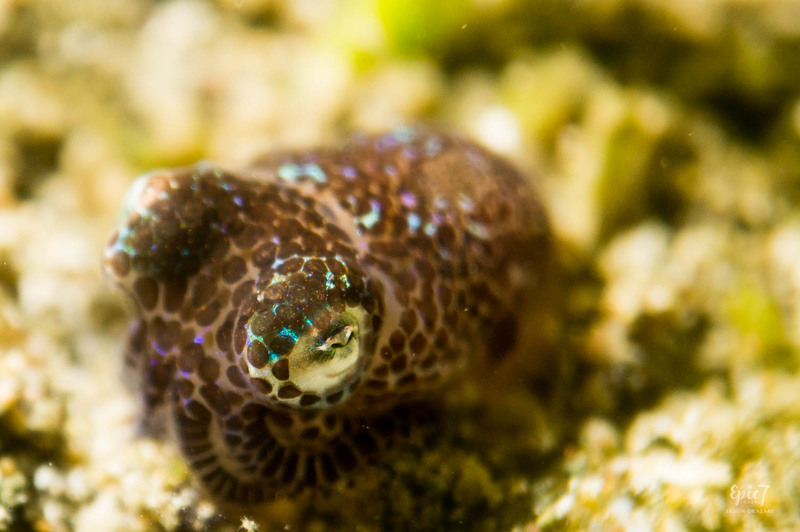 So, capturing one calmly sitting on a piece of coral where you can see the beautiful design and bright green eye is rare. Since April/May & November are the best and most popular months, make sure to book diving and lodging well in advance. Water temps are 81F/27.5C. Most dive sites are a 15-30 minute boat ride. Since the seas are calm and protected, I didn’t need any seasickness remedies. If you do, I recommend Bonine or the ReliefBand. 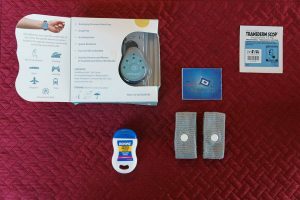 Read more about my go-to motion sickness remedies. We opted for two dives in the morning and two dives in the afternoon. 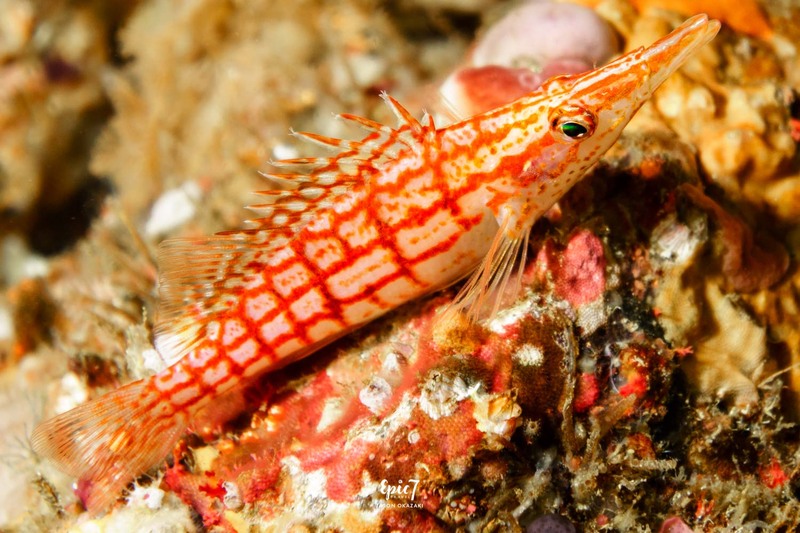 Bring a macro setup for your underwater camera as most of the critters you will spot are small. Visibility is 40 – 50 feet (12 – 15 meters), which works well for spotting. 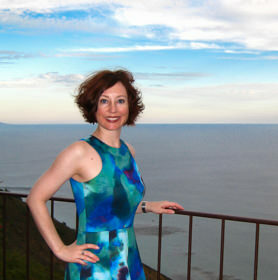 We opted for a full board package at Crystal Blue including lodging, food and diving. They have a nice camera room, which is key for photographers. Despite a direct flight from San Francisco to Manila, I don’t recommend flying with Philippine Airlines. We now fly with Cathay Pacific via Hong Kong to avoid the chaotic check-in and boarding process. If you do opt to fly them, I recommend arriving four hours in advance at SFO (San Francisco) to decrease stress. Perhaps the experience is less chaotic from other airports? Wow, what an amazing job capturing the beauty of even these underwater critters. The tips you give are invaluable! We’ve become hooked on muck diving. We discover new critters in each location as a result of our guides’ eagle eyes! Wonderful blog.This blog Contains the worthful points of scuba diving. I’m so glad you enjoyed it, Andri. 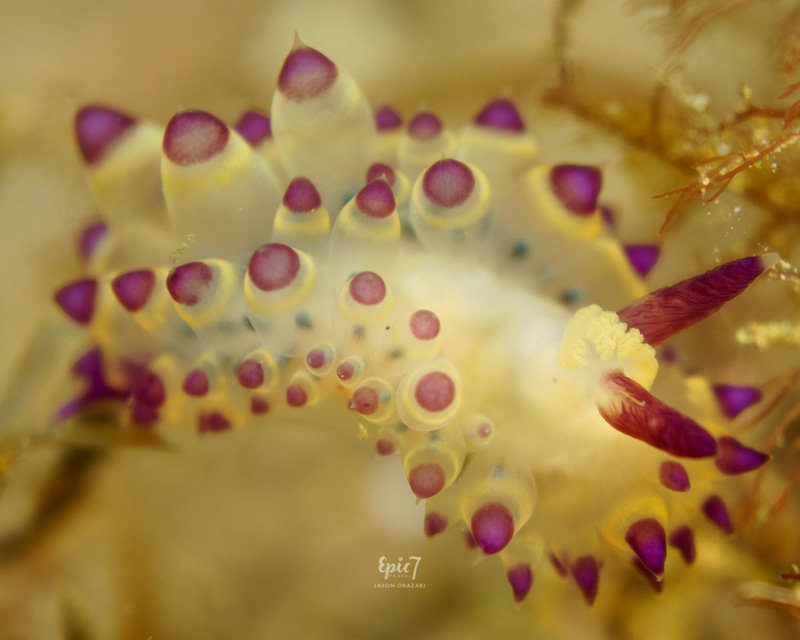 Anilao has so many wonderful macro critters to discover. We hope to return someday!